Santa Catalina Island has drawn Southern Californians for since the mid-1820s. That's when the Pimungan tribe settled there, attracted by the island's rich marine life. 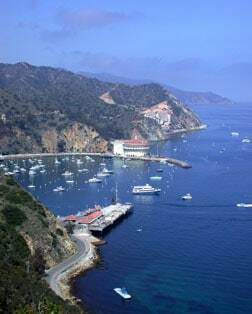 But Catalina's true popularity dates from 1919, the year Chicago chewing gum tycoon William Wrigley purchased the island development. Overnight Catalina secured its reputation as a playground for wealthy magnates and movie stars. Since 1975, the Santa Catalina Island Conservancy has held most of Catalina in trust. Buffalo, imported for a 1924 movie, roam the island's sere uplands. Offshore kelp beds shelter brightly colored Garibaldi fish, sea lions and seals. Gray whales pass on their annual migration, and dolphins are a frequent sight. It's no wonder the island - home to America's oldest fishing club - continues to woo weekend yachtsmen, deep-sea fishermen and divers as well as casual visitors content to explore Avalon's quaint lanes. Note: Your ship will anchor in Avalon and use launches to transport all passengers ashore. With its Mediterranean climate, palm trees, fountains, charming shops and plentiful outdoor activities, this harbor village is equal parts small town island community, quality cultural resort and model ecological town. The epitome of glamour of a bygone era, this beautiful Casino overlooking the Avalon Harbor features art deco murals, a classic 1929 pipe organ and a world-famous Casino ballroom. Built in 1935, this stunning botanical garden show casing plants from all over the world, features a memorial to Avalon developer William Wrigley, Jr. and commanding views of the bay. The perfect adventure destination, Catalina's ruggedly beautiful interior is home to broad valleys, isolated coves, pristine beaches, two-thousand foot peaks and countless species of unique native plants and animals. The blue waters surrounding Catalina feature undersea kelp gardens teeming with marine wildlife including garibaldi, Kelp Bass, Leopard sharks, bat rays, moray eels sardines.